The key to achieving all of these goals is having competent leaders and staff. This scientifically validated service evaluates natural behavior and operating styles using 8 primary factors and 24 sub-factors to clarify an individual’s leadership DNA talents. 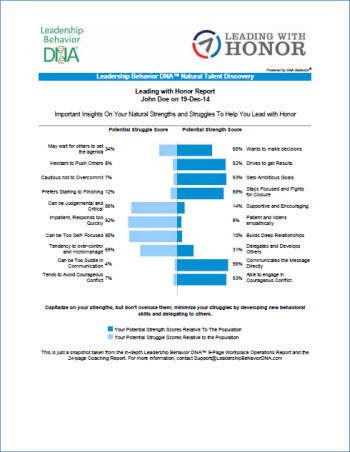 Simply put, we know how to help you and your team discover their personal leadership style. This 24-page report reveals more in-depth results from the industry-leading 24 sub-factors to maximize potential in the workplace, ideal workplace needs, settings, and challenges for optimum performance. This in-depth custom report delivers an integrated look at team member results on the unique behavioral styles of each team member, how they interrelate, and analysis that will help the leader mitigate gaps in team dynamics. This report reveals similarities and differences by graphically comparing the scores of two people and offering communication and relationship keys for each person. Successfully helping leaders, recruiters, and HR professionals evaluate a candidate’s behavioral insights into a person’s best fit for tasks, team roles, work environment, and rewards. Providing suggested interview questions based on their scores, and they relate to both strengths and struggles. This insightful process is designed for leadership development in a coaching setting or leadership development class. These questions cover seven categories of leadership with average scores by question and by rater group in the following areas – Leadership Proficiency, Results Drive, Effective Communication, Relationship Building, Leader EQ, Trust, and Business Values. Learn more about these report services.